All too often sites about famous bipolar people only include DEAD people or people we SUSPECT were bipolar but are really only speculating about. Their courage and eloquence are admirable and much needed. We can only hope that in time, more and more clebrities who suffer from manic depressive illness will “come out”. If so, there will be less stigma, less stereotyping and a lot more understanding, funding and bipolar disorder support. Would you have realized their behavior showed classic bipolar symptoms? Enjoy, share with your friends, learn and feel encouraged. There are some amazing stories here and I urge you to view them all. bp Magazine frequently profiles famous people with bipolar disorder. This magazine dedicated to bipolar is an absolute gem and well worth subscribing to. It is excellent value for money, and always has something educational and fascinating inside. 1. 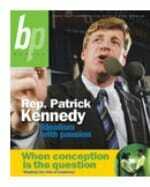 Congressman Patrick J. Kennedy: He has drawn a lot of criticism, but what bipolar person cannot identify with Patrick Kennedy’s battles – the notorious temper outbursts, self-medication, and inner demons? For many Americans he became a hero when he took the fight for mental health parity to Capitol Hill. Others have admired his persistence and honesty. Given his relative youth, there is an amazing amount of good Patrick Kennedy can do if he continues his work on mental health and we are lucky to have him in public office. Read the profile – it is short but inspiring. 2. 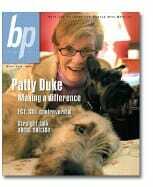 Actor Patty Duke: Patty Duke has written two wonderful autobiographical books about her bipolar, and we have previously profiled Patty Duke here at Bipolar Lives. For an Academy Award winner who has led such a tumultuous life, Patty Duke talks a lot of common sense. In the bp Magazine interview I like the way she explains that, despite all the enticements of euphoria, balanced is a much better place to be. Interestingly, one of her goals with her Web site is to explain to individuals who have bipolar disorder that they will not lose their creativity if they take medication. (Patty has taken lithium everyday since diagnosis with no side effects.) She says that she’s more creative now because she can organize a thought. Actually, she say a lot of interesting things – read the interview! 3. TV journalist Jane Pauley: Here is another celebrity who controls their disorder with lithium, and has no complaints about side effects. In fact, Jane Pauley has no complaints about anything. Her later in life diagnosis with bipolar disorder must have been shattering, but Jane Pauley handles it with graciousness and her hallmark honesty. For me, this is one of the richest of all the bp Magazine interviews, and I would rather you read it than me talk about it. It has many interesting features such as the late age on onset and apparent lack of bipolar family members. There is much here that is intriguing. Although Pauley is one of the more famous bipolar people, her signature girl next door quality shines through, making this an easy story to understand and relate to. Her coming out will no doubt help many not famous bipolar people. 5. 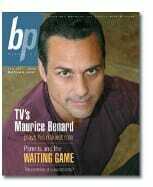 The Fall 2007 issue features soap star heart throb Maurice Benard: However, Maurice is a wonderful advocate for bipolar disorder and his revealing interview can be read free online. Also keep an eye out for him oh the speakering circuit and in the general media as he is a tireless mental health advocate. In particular, I appreciate the way he is so open about taking lithium at a time when many who need this medicine are turning away from it in favor of unproven alternatives. Another amazing thing is how art has mirrored life and Maurice has managed to integrate bipolar disorder into the storyline of General Hospital. His many interviews have included Oprah and CNN and it is hard to think of any star who has shown more energy or thoughtfulness in their public bipolar advocacy. Linda Hamilton was diagnosed with bipolar late in life, and refers as the years from ages 20 to 40 as “her lost years”. Her rages and mood swings destroyed her marriages and, despite her considerable professional success, she describes her life before treatment as “bleak”. Interestingly, she is another bipolar celebrity who emphasizes the importance of her children in her journey to wellness, and also stresses the importance of exercise and structure. Linda has done three particularly powerful and informative interviews which are educational and motivating, even to those who have lived with bipolar for a while. I highly recommend Linda Hamilton’s Larry King Live interview, the Linda Hamilton Oprah interview, and a short but information packed piece done by Associated Press and MSNBC. All three are very worth looking at. They are richer than many of the pieces on famous bipolar people because of their practical content and because of Linda’s willingness to discuss lesser known forms of mania and self-medication. Of all the material on this page about famous bipolar people, I feel these three interviews may be the most valuable. Jean-Claude Van Damme is an action hero, kickboxing superstar, and another of our famous people with bipolar disorder. Van Damme was married four times between 1984 and 1994, and was a cocaine addict in the 1990s.Fortunately he was diagnosed with rapid-cycling bipolar and began taking medication – what Van Damme refers to as “that simple salt”. That simple salt has turned his life around and he has now returned to his third wife and was able to quit cocaine cold turkey. Van Damme’s is an interesting story because it highlights yet again how long even a prosperous person with access to great healthcare can go undiagnosed, how typical substance abuse is for bipolar people, and how ruinous hypersexuality and other manic symptoms are to our marriages and other important relationships. Mariah Carey recently opened up about her battle with bipolar disorder. Like many suffers, she was in denial for years. The Grammy award winning singer told People Magazine that she is proudly sharing her story now. Want to know about some more famous bipolar people? Check out our bipolar autobiography page. Please use our Contact form (see the menu on the left) if there are famous bipolar people you would like to see included here. Some of these stories of famous bipolar people are inspiring – others are sad or disturbing. Getting correctly diagnosed is essential, and most people with bipolar disorder can benefit greatly from the support offered by a rehab facility, especially if it is also a bipolar treatment center. Famous people with bipolar disorder include some of the world’s foremost musicians, actors, writers, composers and scientists. Bipolar disorder is in the news constantly right now. This has done a lot of good in terms of raising awareness and shattering some of the myths about bipolar. However, unfortunately some of the coverage is still uninformed or unbalanced in its negativity. The bipolar celebrity angle gets a lot of attention, but so much valuable information about how successful people have triumphed over bipolar never makes it into the popular media. Hi. I am a 37-year old female with bipolar disorder 1, and I want to thank you, intensely, for posting this article because it has already begun to be helpful and inspiring to me- bipolar peeps need positive reinforcements, and this is indeed a resource to direct us towards the light we need sometimes to be so bright and distracting so as to release us from our own self- judgements so we can have hope and healing, and get our lives back. Yeah man I also suffer with type 1 bipolar and my best friend has type 2, it’s always great to see how much information there is about it now and how to at least try and control it. I hated the idea of meds but my nightly dose of Quetiapine does help a lot. I still experience euphoric highs and catastrophic lows but I think this will be the first year where I will be in control and not my bipolar. Lastly I find that cannabis helps particularly during the manic phase as it keeps me at a good level. Anyone else out there with bipolar let me say it can be s**t at times but you’re worth it to pull through the darkest hours bipolar throws at you.